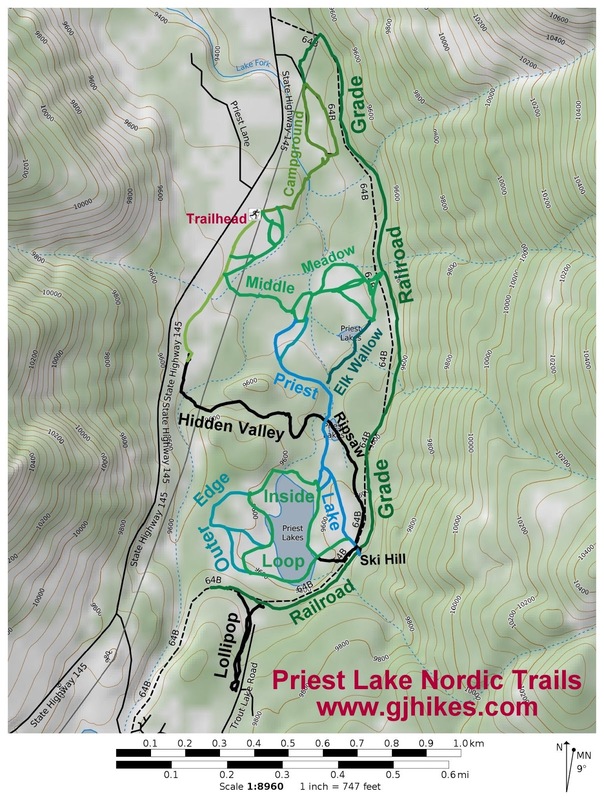 The Lollipop trail is located in the Priest Lake Nordic Trails area near Telluride, Colorado. The trail begins off of the Railroad Grade trail where it makes a short but steep climb up to a turnaround point. 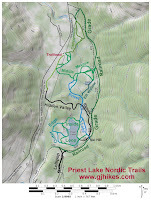 The shape of the trail gives it its name and the steepness of the trail gives it its 'Most Difficult' rating. The Lollipop trail begins within a few hundred yards from the end of the Railroad Grade trail. Lollipop connects to the Railroad Grade trail in 2 places that are about 100 feet apart. Both routes come together after a short distance and become a single trail after that. The trail, which receives the same grooming as the other trails around Priest Lake, cuts a wide swathe through the trees. The upper end of the trail is a little steeper than the rest. The average grade is 8% with only about 74 feet of elevation gain. 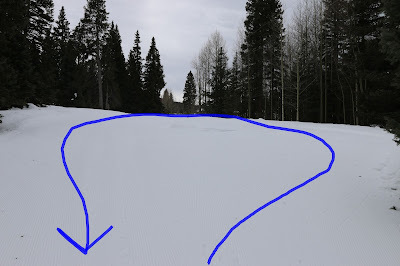 The groomer packed out a big cul de sac at the end of the trail. It appears to be all private property beyond that point. Those that make the effort to climb the Lollipop trail have a nice quarter mile downhill run to look forward to. The Lollipop trail is a nice out and back for anyone looking for a short but fun challenge. Depending on the route that you take it is mostly all downhill all the way back to the trailhead. We backtracked along the Railroad Grade and knocked out Ripsaw, Elk Wallow and Middle Meadow after finishing up Lollipop. If you would like to see it for yourself then all you have to do is 'Take a hike'.